Aisslinn Nosky leads the Handel and Haydn players through Mendelssohn's library. Photo: James Doyle. 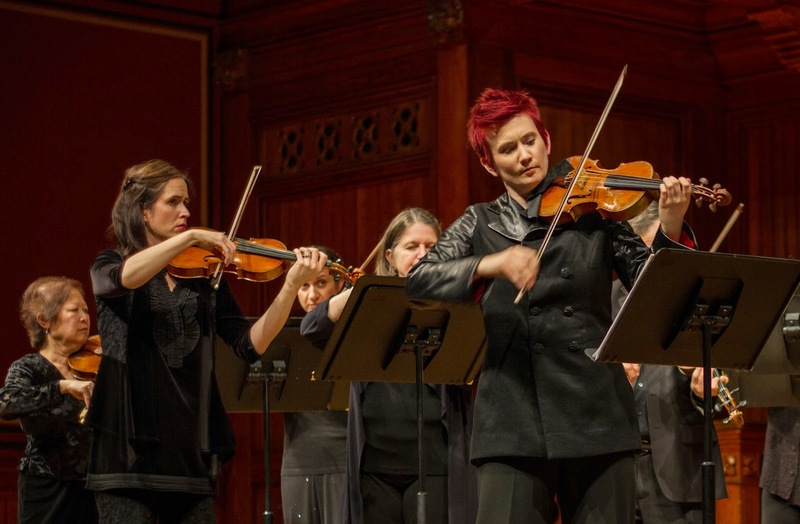 It's easy to see the appeal of a program like Handel and Haydn's "Mendelssohn's Library" (which played last weekend at Jordan Hall and Sanders Theatre) - especially its appeal to period music lovers. For the great Mendelssohn-Bartholdy (his full name) was not only highly influenced by the music that came before him, but was also perhaps the first period music advocate. Indeed, we probably wouldn't know half of what we know of Bach without him (hard as that may be to believe). So a concert drawn from his personal scores counts as a kind of dream-come-true for any serious period-music pedant. 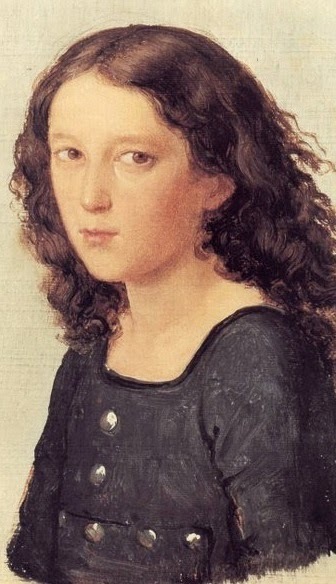 But Mendelssohn's reputation has its flip side (perhaps even its down-side): this particular genius was so entranced by the past that many have argued it held him back. And there was certainly a conservative cast to his style, along with an oft-expressed personal distaste for the romantic excesses of his own generation (don't worry, they sniffed right back). So there's much to unpack in the thesis at the core of this concert - if said thesis had been clearly explicated, that is. But I'm afraid under the guidance of concertmaster Aisslinn Nosky (she of the flaming hair and even more fiery playing) things at Handel and Haydn got a little muddled, at least on opening night, although splendid musicianship (including a brilliant turn by Nosky herself) did eventually shine through some initial murk. Her curation of the evening was certainly solid - the selections Nosky chose from the stacks included Handel and Vivaldi, as well as (of course) J.S. Bach and C.P.E. Bach (one of his best, the Sinfonia in B-flat Major, Wq. 182/2). Unfortunately the actual execution of one or two of these works was uneven, and didn't seem to shed much new light on Mendelssohn. We all know there's a mix of baroque, classical and rococo (that's C.P.E. Bach's brief period, btw) undergirding this composer's achievement, but the specifics of their correspondence to the early (very early) Violin Concerto in D Minor remained vague, as the work itself plays chiefly as a sparkling showcase for its soloist (but more on that later). And to be honest, sometimes the playing at H&H suggested subtler questions of historicity; in a nutshell, Nosky led most of her program in a high-energy, millennial style - but is our idea of period performance the same as Mendelssohn's? One sometimes wondered - and indeed, Nosky definitely adjusted her approach when tackling Mendelssohn himself. So was she possibly missing the element in these earlier works that seduced the young composer? Yes, his structural debt to them is obvious (particularly in his juvenilia) - but you don't need a performance to prove that; you would hope that in concert something more elusive, something akin to the sources of the composer's voice, might come clear. You couldn't argue, though, with some of her interpretive choices; her take on Vivaldi, for instance (Concerto in G Major, RV 151, "Alla Rustica") proved particularly potent. Played with unrelenting force, the simple blocks of its Presto and Allegro seemed to almost blur into a hypnotic drone; suddenly hints of Philip Glass and John Adams, rather than Felix Mendelssohn, seemed to hang in the air! Nosky's take on Handel's Concerto Grosso in B Minor (Op. 6, No. 12) was perhaps less compelling, but still respectable; this time its lilting dance had an unusually muscular thrust, which felt a little pushy in the Largo movements, but worked splendidly for the hurtling Allegro. It was in the key work by Bach (the familiar Concerto for Two Violins in D Minor, BWV 1043) that the program suddenly hit some serious chop. There had been a few intonation issues early on (the gut strings of period instruments are notoriously sensitive to temperature and humidity), but these suddenly seemed more prominent, just when pitch counted the most; for like so much of Bach, this concerto depends on precisely-intertwined musical voices. Worse, these melodic lines began to slip slightly out of synch as well as pitch - perhaps a piece like this is simply at the limit of what a conductor-less ensemble should attempt. These problems were at least somewhat occluded by the duet between Nosky and Christina Day Martinson, Boston's two leading ladies of period violin. But while Martinson struck me as gently suggesting some subtle ripostes to Nosky's need for speed, this never quite coalesced into a statement; and frankly a superstar showdown, however friendly, isn't quite right for Bach anyhow. Then a peg seemed to slip on Martinson's instrument, so there was a frustrating lull in the whole performance - the upshot was that both ladies were outplayed in the end by the lower end of the string section: the cellos (Guy Fishman and Sarah Freiberg) sounded fine, and the bass line from Pippa Macmillan was the chunkiest I've ever heard outside of a night club. Luckily, things turned a corner after intermission, when the lesser work by the lesser Bach, C.P.E. 's Sinfonia in B-flat Major, came off as far more polished than the masterpiece by his father. Suddenly the ensemble was playing with lightly balanced coherence, and Nosky seemed to revel in the clever effects and sudden contrasts of the rococo style: the Adagio was punctuated by hauntingly clean cello plucks, and I nearly giggled at the 0-to-60 zoom that kicked off the Presto. The ensemble held to the same high level for the capstone of the concert, Mendelssohn's rarely-heard Violin Concerto No. 1, in D minor, which I suppose will live forever in the shadow of its much-later, much-loved cousin in E-minor, but which is ravishing in its own right. Indeed, what strikes one immediately is the silvery spill of inspiration that pours forth from it. The composer was only 13 years of age when he completed it (a portrait at 12, at right), and the concerto seems to almost embody the spirit of youth and fresh musical invention. What's more, Mendelssohn's distinctive voice - his lyrical felicity, his warmth and nervous lightness - can already be heard sounding in many of its passages; and was even Mozart so freely himself so early? One also wondered whether it mattered at all what exactly was in Mendelssohn's library - surely a talent like this could have made something brilliantly fresh out of anything. Needless to say, Nosky herself was dazzling in her many quicksilver solos, and her own spritely person - in her tailored, masculine jacket she might have been a musical Peter Pan - somehow conjured a haunting connection with that of the lost youth of this charming composer. Mendelssohn was of course primarily a pianist, but he was conversant with the violin; could he have lavished the bedazzlement of his first concerto on himself? At times, watching and listening to Nosky, it was hard to fight the feeling that she was conjuring something of the composer's very presence as she performed.